Photo: Flickr / Africa RenewalThe kidnap of over 200 girls from a secondary school in Chibok, North Eastern Nigeria by Boko Haram in April 2014 has shone an international spotlight on the northern part of the country for the first time in decades. However, the states north of the Niger and Benue rivers had already been on development radars in recent years, with the predominantly Muslim and Hausa speaking region garnering interest around women’s issues well ahead of the recent crisis. Despite the recent announcement of the country’s ascendancy as Africa’s largest economy with a GDP of $503bn for 2013, poverty and inequality in Nigeria remain high. In the north of the country, the irony is deeply felt due to some of the lowest levels of employment and per capita income, making economic development, educational access and health key priorities. Within this, women’s rights are a constant thread: The UK Department for International Development (DFID) Nigeria’s gender strategy within its operational plan 2011 – 2015 has clear targets for women and girls in the North in particular, while Mercy Corps and Girl Hub have engaged with the economic empowerment of adolescent girls in the sub-region. Other actors such as UNICEF and Save the Children are working directly with maternal and child health. But although Nigerian women’s movements have been at the heart of the mobilisation around the #BringBackOurGirls campaign, not to mention that the region has produced well-known African feminists such Amina Mama and Ayesha Imam, broader northern women’s narratives remain largely unheard and unrecognised within an overall development and women’s rights discourse that will continue long after the hashtags of this crisis have diminished. Challenges facing women in the north are undeniably significant. In the North West, the most recent National Demographic and Health Survey puts the literacy rate for women at 21%, compared to the national rate for women at 51%. These figures are even more acute at the State level, where northern states like Katsina and Sokoto stand at 5% and 9% respectively. On maternal health, the North East zone has the highest maternal mortality and morbidity rates in the country, an almost ten fold difference compared the South West zone. As a result, the debilitating consequences of obstetric fistula remain a too often outcome. Early and child marriage also remains a hotly controversial issue. Practices such as purdah, or seclusion (kulle in Hausa), that determines the extent of women’s visibility and mobility in public spaces are also a key part of the prevailing narrative. Dr Lydia Umar, Executive Director of the northern-based Gender Awareness Trust (GAT) in a recent interview described the “herculean task in the northern part of Nigeria where the position and roles of women in society tend to be confined to the private sphere”. Women’s representation in political life is therefore low. How then have women in northern Nigeria articulated agency and resisted marginalisation over time? Within the history of the pre-Caliphate Hausa City States there is still no figure more revered than Queen Amina of Zazzau, a legendary rule of war-driven territorial expansion and ingenuity in architectural defence. A masculinised legacy perhaps, but this sits alongside a history of feminine, women for women activism inherent in the region. The most famous of these is the poet, scholar and activist Nana Asma’u, sister of Sultan Usman Dan Fodio and at the heart of a movement promoting women’s literacy and agency across the north in the 19th Century Sokoto Caliphate. More recently, the post-independence activism of Hajia Gambo Sawaba in the mid to late 20th Century remains a beacon for strident, uncompromising women’s voices everywhere. 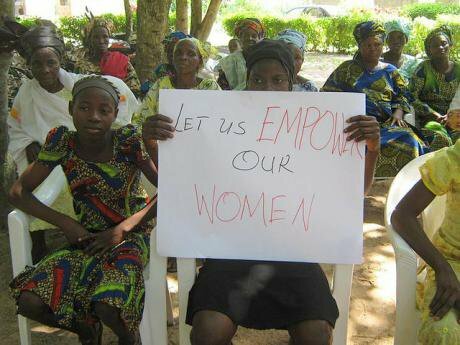 Today, activism by northern women in organisations such as the Federation of Muslim Women ‘s Association in Nigeria (FOMWAN), and ABANTU remain undeterred. FOMWAN has for many years promoted education and better health for all, but particularly women. Bilkisu Yusuf, a founding member of FOMWAN clearly argues: ‘Education is the most strategic form of empowerment you can give women. Islam makes education compulsory, so we are unhappy at the low level of education among Muslim women”. Despite the low levels of literacy, that these books are written in the region’s lingua franca has meant that the reach is still significant, while the ownership and women’s compact that a mother-tongue narrative gives - written by women and often using familiar colloquialisms - is undeniable. Of course such forthright writing has sometimes lead to criticism, despite the fact that the books in themselves are diverse and nuanced in their approaches. A founding author like Bilkisu Funtua who lives in purdah with her family and whose work has upheld religious observance and filial piety whilst addressing women’s rights, is just as likely to garner criticism as Sa’adatu Baba, a younger novelist who was accused by a Kano State Government official of taking a bribe from European governments to spoil northern Nigerian culture after she wrote about the impact of HIV/AIDS (Mu Kame Kanmu – “Keep Ourselves Safe”). But the independence of women writers in itself has been a key determinant in their ability to resist and respond to such pressures. Predominantly self-published, either as individuals or as part of women’s writers cooperatives, the rapid sale of these books have withstood attempts at censorship from the Kano State Censorship Board. Many women writers have also moved into the popular Kannywood film industry of northern Nigeria. Undoubtedly, the major focus of the world’s attention on northern Nigeria is the current Boko Haram insurgency. Within that the discussion of inequality has been largely concerned with understanding the prevailing issues of poverty and (male) disenfranchisement that may explain the root causes of the conflict. However, the increasing use of gender based violence against women reported since 2013 highlights the need for women’s engagement on the issues to now be prioritised. External actors working on women’s rights in northern Nigeria must first and foremost capture and understand the rich tapestry of diverse narratives if gender and development engagement is to lead to any meaningful, sustainable change. The challenges of women in the north are indeed great and in need of focus, resources, and commitment. However, in the complex and sensitive landscape of Nigeria’s northern states, the necessary mantra that change must be led and owned by northern Nigerian women themselves has never been more critical.